Bratislava has received funding from “EEA Grants and Norway Grants” (hereafter called EEA Grants) for an urban climate adaptation project. The project entitled ‘Bratislava is preparing for climate change’ implements measures to enhance the resilience of Bratislava city to the adverse impacts of climate change, in particular intense rainfall and heat. These measures include tree planting, green roofs and rainwater retention facilities. The benefits are primarily for the most vulnerable inhabitants of Bratislava: elderly people and children. The € 3.3 million project is for 85% funded by EEA Grants. The remaining 15% comes from the city office and two participating city districts. The main project partners are the city of Bratislava Office, the city districts of Nové Mesto and Petržalka, and the Norwegian partner COWI. But also other stakeholders and knowledge partners (NGOs, Comenius University) are involved to secure exchange of knowledge and coordination of measures. In Bratislava (Slovakia) climate change will be felt particularly in the expected rise in average temperature, more heat waves, and long periods of drought on the one hand, and more extreme rainfall, resulting in an increased risk of local floods. The City of Bratislava has prepared and approved a strategy on adaptation to climate change and is preparing an Adaptation Action Plan. This plan promotes delivery of climate change adaptation through different types of adaptation measures (with special focus on heat and rainwater management) and cooperation among decision-makers, planners, the private sector and local communities. The main target groups are the inhabitants of Bratislava city, especially the vulnerable groups (elderly people and children). The project ‘Bratislava is preparing for climate change’ practically contributes to the strategy’s implementation and realizes several solutions to relieve heat stress and problems with rainwater discharge. The “EEA Grants and Norway Grants” represent the contribution of Iceland, Liechtenstein and Norway to reducing economic and social disparities and to strengthening bilateral relations with 16 EU countries in Central and Southern Europe and the Baltics. Iceland, Liechtenstein and Norway are not EU members but are members to the European Economic Area (EEA) Agreement. This type of EEA Grant will distribute € 4 million between projects aiming to find economically efficient and environmentally sustainable adaptation measures to climate change risks through a variety of measures. The minimum grant amount is € 1 million. Cities or city districts with more than 20,000 inhabitants and a municipal area of at least 300 hectares are eligible. Bratislava has successfully applied for funding for its project ‘Bratislava is preparing for climate change’ to finance climate change adaptation measures. Rehabilitation of a square (Námestie hraničiarov) in the city district of Petržalka of the city of Bratislava. On a square of about 1 ha the pavement will be replaced by grass areas, trees, and flower beds. A water capturing and irrigation system ensures resilience to drought. The project is implemented by the city district of Petržalka, which is - with 100,000 inhabitants - one of the larger and most densely populated districts of Bratislava. A green roof of 1,000 square meters size on a care home for elderly people owned by the city of Bratislava. The main function is buffering the discharge of excess rainwater. 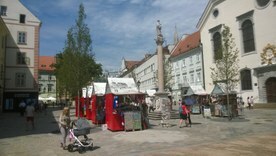 On two important squares in the city centre – in the historic centre the main square and in the greater Old town the Námestie Slobody (which is bordered by buildings of the Slovak University of Technology and governmental office buildings) - trees have been planted to provide shade on hot days. This very visible result has been realized after very long negotiations with many departments in the city, overcoming arguments on the historic character of the squares, archaeological issues, etc. The project was implemented by the city. Two tree-lined avenues have been realized, providing cool corridors that connect important big roads in the old town. One consists of 15, the other of 45 large trees. The project was implemented by the city. In Svoradova street, in an area with previously no green public spaces, a ca. 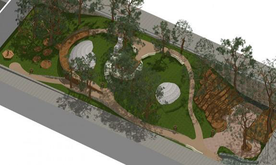 1,000 square meters park will be realized. It will contain a variety of water retention measures (sustainable drainage systems and underground rain water storage tanks) implemented by the Old town district. Nové Mesto district was historically an industrialized area with food processing factories and chemical industry. Today the brownfields are being transformed into apartment houses. 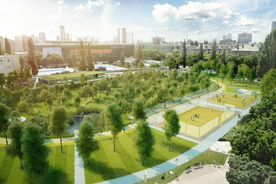 The former velodrome (about 3 ha) will be revitalized and transformed into a multifunctional leisure area and a new green space for the inhabitants (on a former chestnut plantation) will be created. The newly developed areas will contain various recreational elements for the inhabitants and their children, including playgrounds and visible water flows. The district of Nové Mesto will implement the sub-projects. In the Bratislava Forest Park - a 19th century designed landscape park – existing water reservoirs of one of the very few remaining streams flowing down from the Male Karpaty mountain range will be revitalized. These are important from the point of view of fire protection of the forests and surrounding areas, but they also support local biodiversity and can take-up excess rain water in times of heavy rainfall which would otherwise flow into the city. The project ‘Bratislava is preparing for climate change’ also includes a small projects grant scheme for support of sustainable drainage systems. A total amount of € 50,000 will be made available for small projects up to maximum € 1,000 per project. Eligible applicants are private home owners, NGOs and businesses. The grant covers a maximum of 50% of total costs for the small project implementation. It is expected that these will be used for water reservoirs, rainwater gardens, small green roofs, adjustment of pavements, use of permeable materials, etc. The grant scheme comes with consultancy for applicants and dissemination activities. The applications are assessed by the steering committee of the project, consisting of the Office of the Chief Architect, Department of Strategies and Projects and Department of Environment. Bratislava consists of 17 independent city districts, and the Bratislava City Office provides overall coordination. Bratislava City Office has asked the city districts whether and how they would like to be involved and which sub-projects would be relevant within these districts. Apart from the city districts, cooperation was sought with the Bratislava Regional Conservation Association, Bratislava Water Company, City Committee of Slovak Nature and Landscape Conservation Union, City Forest in Bratislava, Comenius University in Bratislava, Nature Sciences Faculty to involve them in the plans. The Norwegian partner COWI was involved because of its experience in the field and to underline the spirit of the EEA Grants regarding international cooperation. Some stakeholders are directly financially involved (as further described below) as they get budget from the grant and bring in some own investment (amounting to 15% of total budget). Other stakeholders are involved to transfer knowledge and to be able to implement mainstream adaptation measures into wider plans, such as on water and nature management. Bratislava City Office. Provides overall management and publicity of the project. The coordination of the ‘Bratislava is preparing for Climate Change’ project is done by a Steering Committee which consists of a chairman (the chief architect of the City) and a number of members, who are representatives of different departments of the Bratislava City Hall, i.e. departments of: strategy project management and financial resources, en-vironment, territorial system coordination, social affairs, transport, infrastructure etc.. The Committee also includes representatives of scientific organizations (i.e. Geograph-ical Institute of the Slovak Academy of Sciences and Comenius University in Bratislava) and non-governmental organizations. Depending on the needs of the sub-project under development, the relevant members of the steering committee meet. The steering committee also decides on the grant applications for private sustainable drainage systems. City district Bratislava - Nové Mesto ‘New Town’ and City district Bratislava – Petržalka. Both city districts are responsible for analysing options to solve problems in their cadastral area and directly implement planned measures in their district. They are also responsible for the communication of the results achieved. During the strategy and action plan development, already existing relations and cooperation with other stakeholders have been further strengthened. The project is promoted through the city districts’ web page. COWI. It is a consulting group which has more than 80 years of experience in the environmental protection sector. Their experience and knowledge has been a valuable asset in the project implementation, mainly in the engineering phase, the implementation of measures, communication and the exchange of experiences and the dissemination of project results. COWI has received budget for travelling to enable the cooperation with Bratislava and has provided assistance in problem solving and the establishment of future cooperation with other sectors in Norway. Bratislava Regional Conservation Association (BROZ). It is an NGO focused on nature, landscape and environment conservation. As a project partner, this association contributes to the sustainable management of city forest area and to the development of a local system of ecological stability. Bratislava Water Company (BVS, a.s.). It is a joint stock company including also Bratislava City among its share-holders. It provides its professional services and technical assistance during sub- projects implementation. Slovak Nature and Landscape Conservation Union (SZOPK). It is an umbrella NGO focused on nature, landscape and environment conservation. Its branch office located in Bratislava City participates in the project as legal entity. It promotes communication with the general public, local communities and it helps increase public awareness about the project. City Forest Company in Bratislava. This company is incorporated in the Statute of Bratislava Forest Park. Some proposed measures are implemented in Bratislava Forest Park so the City Forest Company needs to be involved in the project. Nature Sciences Faculty of Comenius University in Bratislava. The university is an educational and scientific institution. It provides professional advice and methodical assistance for the Adaptation Action Plan. In the ‘EU Cities Adapt project’ - a project of the European Commission run during 2012-2013 and aimed at capacity building for adaptation strategies for European cities - the city of Bratislava was one of the selected cities for the training phase. Within this project Bratislava established a working group in which the City Chief Architect and all relevant departments within the city participated. This working group identified the climate risks of the city, engaged external stakeholders and developed a draft adaptation strategy. This work formed the basis of the proposal to apply for EEA Grants. In the meantime the adaption strategy was developed into a draft climate adaptation action plan. This predecessor project helped the city review its climate risks and corresponding adaptation needs and formed the basic project idea and objectives. Therefore it was one of the two key success factors in obtaining the funding. On the other hand, the good support from the Government Office of the Slovak Republic, which has an EEA Grants Department, and the user-friendly application procedure of the EEA grant facilitated the process of applying for the necessary project funding. Bratislava City Office applied for funding under an EEA Grants open call in order to implement a number of measures that were identified during the development of the climate adaptation action plan. The timing of the call fitted perfectly with the stage of development of the action plan which is currently being finalised. First, a limiting factor have been the complex procedures for the implementation of measures in terms of permits and obligations for public works, time consuming public procurement procedures, and archaeological aspects that have to be taken into account in a historical city. Another limiting factor is that the Bratislava districts themselves have their independent governance structure which makes it more difficult for Bratislava City Office to coordinate processes. Total project costs for the whole ‘Bratislava is preparing for Climate Change’ project are € 3,337,640, of which € 2,411,445 come from EEA Grants (Adaptation to Climate Change - Flood and Drought Prevention, priority sector Climate Change). The remaining € 926,195 comes from the Bratislava City office and the City Districts of Nové Mesto and Petržalka. The budget was divided over the partners according to their contribution to sub-projects and project management tasks. The grant holder of the project is the Bratislava City Office. It provides management: project coordinator, accountant, managers for publicity and particular activities. The project is monitored through regular reporting to the EEA Grants provider. Costs of the total project are management costs, publicity, small grants, and construction activities. The benefits of the project and related sub-projects are difficult to directly express in terms of money. Financial benefits are for example related to less damage caused by flooding during expected intense rainfalls, and better health conditions leading to less medical and societal costs for vulnerable people during heat-waves by providing areas with shade. Apart from climate change aspects, green spaces in general contribute to well-being. In addition, the cooperation among project partners and exchange of experience and knowledge that are built up during this project will pave the way for future projects to implement the Adaptation Action Plan. Local regulations limit the application of some of the adaptation options. For example, Bratislava has a regulation to prevent soil pollution from parking places, stating that they should have an impermeable surface and a space to collect oily water. This precludes the use of permeable pavement on parking places, which otherwise would be perfectly suited for increasing the infiltration of rainwater. The local situation, with lots of underground parking garages, precludes planting of trees in many places. On the other hand, the Masterplan of Bratislava requires 10-60% of newly developed plots to be green; the percentage depending on the district and the type of building. This requirement is little overseen, however. The final version of the Adaptation Action Plan itself still has to be approved by the City Executive Board which consists of the City Mayor, all city district mayors and the deputy mayors and other members up to a count of 10, who are elected by the City Council. The whole project started in 2014 and is scheduled to finish in 2017. Due to time-consuming procedures for permits and public procurement the implementation time is expected to extend beyond the official end date of the project. The grant involves the realization of several sub-projects with different lifetimes: 20 years for green roofs, 40 years for trees on a square, centuries for a park and a few decades for rain water retention facilities. All green areas however also need regular maintenance.